Airing My Laundry, One Post At A Time...: League Of Denial: The NFL, Concussions, and the Battle for Truth Review and Giveaway! League Of Denial: The NFL, Concussions, and the Battle for Truth Review and Giveaway! I'm really not into it. The sport looks too insane for me. 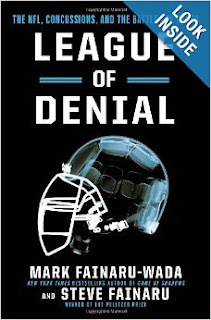 However, I was interested to read League of Denial: The NFL, Concussions, and the Battle for Truth by Mark Fainaru-Wada and Steve Fainaru. Honestly, reading it made me glad that my son was not interested in football. I would not think a helmet could prevent the crazy blows that sometimes happens in games or in practice. I found it a shame that the NFL seemed to want to hide injuries from the public and not want to protect their players more. I mean, aren't the players getting paid millions? Wouldn't they want to protect that? Mind you, I still find our military soldiers to be the true heroes in the world--they are getting shot at and protecting our country--but the football players still deserve to have better protection. It's awful that so many are dealing with multiple concussions. I found the book well-written and interesting--for those who are avid football fans, they will find it eye-opening. To learn more about the book and its authors, you can check out the book website. If you want to buy a copy of League Of Denial you can purchase it from Amazon or other book retailers. I have a copy of League of Denial that one lucky reader can win! Mandatory Entry: Tell me who you'd give the book to if you won a copy. Would it be for you or a gift for someone? I will run this contest until November 9th. I'd probably keep it to read, but I would pass it on to my dad to read afterwards. I think he'd be interested in it, even though he's a bigger baseball fan. I'm with you. Never been into sports and just can't find the energy. My husband and daughter love college football. Me? Eh. I'd probably give the book to my husband. He's always talking about who was injured when and where and how it happened and blah blah blah. I would read it first, then maybe give it to my cousin who is a huge football fan.. if he is lucky ;D ha ha! Football. I am really into it. This book is on my to-read list, but if I won it I think I'd save it for my dad for Christmas, and let him read it first. The book would be for me first and then my husband in case we have a boy! I used to think that I would definitely want any son of mine to play football, but all of this concussion/head trauma talk is so scary!! I would read it because it seems very interesting. Then I would give it to Mr. Big because he is an avid football fan and used to play football when he was younger - he finds things like this very interesting and has even commented on the fact that it has gotten more and more dangerous - don't get him started on how sports teams like to cut down on costs and therefore not all their equipment is "the best"
I would read it, then pass it to my husband. He and I have talked about this issue before, and I think it'd be interesting to read a researched account of what's happening. I would probably pass it on - my son-in-law is a football fiend! I would read it and then give it to either my dad - an avid football fan - or my cousin who played football all through high school.